Bryce Harper talks with teammates during drills on Sunday in Clearwater. Bryce Harper’s Phillies jersey is a bestseller, and ticket sales are through the roof. But can the Phillies win more than 88 games? The latest odds have the line at 88.5. 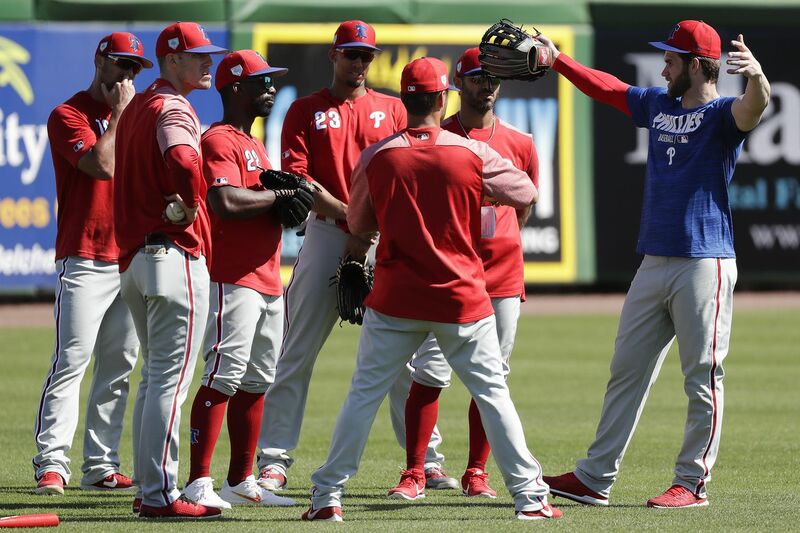 Matt Breen, Bob Brookover and Scott Lauber give their predictions now that the division landscape has changed and Bryce Harper is officially a Phillie on the latest episode of Extra Innings, a new podcast from the Philadelphia Inquirer. Speaking of Harper, what does his signing mean for the rest of the outfield? Where does Andrew McCutchen fit in, and what about Nick Williams? Odubel Herrera and Roman Quinn are both injured; could one of them not be on the roster on opening day? Our coverage team discusses all those questions and more -- who will be on the bench come opening day, and the change Jake Arrieta made in the offseason that he thinks will make him more consistent. You can find Extra Innings on all your favorite podcast platforms: Apple Podcasts, Stitcher, Spotify, Soundcloud and Google Play.